Hundreds of lakes in Siberia are showing worrying signs. 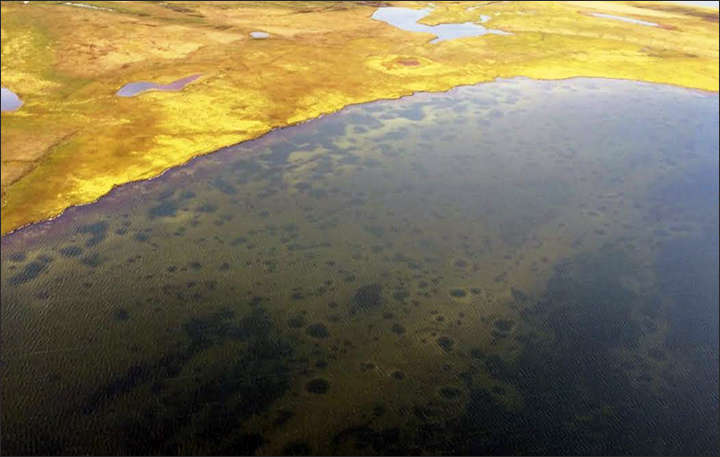 Satellite images indicate that many lakes in the Yamal Peninsula of Russia, way up in the Arctic Circle, have massive craters on their floors that are bubbling methane. The cause of this is the lake’s permafrost melting. As the name suggests, permafrost is a mixture of ice and soil that has been frozen solid for more than two consecutive years. A warming climate means more and more permafrost is beginning to thaw in this pocket of Earth, thereby unleashing and reviving the microbial life within its soil, causing methane and other greenhouse gasses to pump out. The satellite data from 2015 to 2016 has found more than 200 lakes that are emitting notable levels of methane, the Siberian Times reports. As you can see from the satellite images, they also stick out with a bright blue glow. Professor Vasily Bogoyavlensky, deputy director of the Moscow-based Oil and Gas Research Institute at the Russian Academy of Sciences, says this is because the sulfur in the gas results in a certain type of algae to start flourishing. “These lakes have a number of features, which can help identify them from a distance: the anomalous blue colour of water, the presence of craters on the bottom and gas seeps in the water, the traces of gas in the seasonal ice cover, as well as active coastal erosion and permafrost swelling near the water's edge,” Professor Vasily Bogoyavlensky told the Siberian Times. The Yamal Peninsula is Russia's main reserve of natural gas and oil, two of the country’s most valuable assets. This itself is a big reason why Russian scientists are getting anxious about the problem. This specific discovery has not been part of the peer-reviewed process and Bogoyavlensky has said that further research will be carried out. The Siberian methane problem has been popping up a bit recently. Just this week, it was reported that there could be as many as 7,000 underground methane bubbles beneath Siberia.